Dr Gill was very nice took his time to listen and gave great advice. Very friendly spoke very clear easy tounderstand. Will be going back Great friendly Dr.
Dr Gill was very nice took his time to listen and gave great advice. Very friendly spoke very clear easy to understand. Will be going back Great friendly Dr.
He’s a very kind and attentive doctor. He didn’t dismiss my concerns and answered my questions with good explanations. 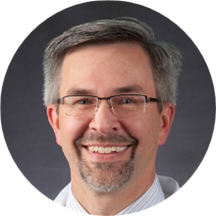 Michael Gill, MD, PhD, FAAP, is a med-ped physician at Loyola Medicine. His clinical interests include allergies, diabetes and preventive medicine. Dr. Gill is an assistant professor in the Department of Primary Care at Loyola University Chicago Stritch School of Medicine. He earned his medical degree at the University of North Carolina, Chapel Hill. He completed a residency in internal medicine and pediatrics at the University of Michigan Medical Center. Dr. Gill is board certified in internal medicine. Dr Gill has wonderful bedside manner and took time to listen to my symptoms. Dr Gibbs was friendly, informative, and attentive, I would highly recommend him. Very friendly and nice. Definitely would recommend. I was very pleased. The visit was a "new patient"/annual check up. Dr. Gill listened to my concerns about my health and offered insights for me to stay healthy and improve areas that need improvement (e.g. increase my exercise routine andmodify my diet to lower my slightly elevated cholesterol count, stretch regularly and monitor posture to avoid back pain issues, etc). Since the Loyola system is able to access my health records from my previous medical group, Dr. Gill was able to check on the state of past "issues" and update my records. I imagine he's a very good pediatrician (one of his special areas), because he has an excellent bedside manner; easy to talk to, good listener. My stated goal to Dr. Gill was to find a doctor who I could rely on for preventive advice and obviously accurate diagnosis and treatment when necessary. The other folks working here we're also very friendly, professional, and accommodating.